Not only did Jesus allow Himself to be murdered (wow, as if that isn’t enough to wrap our minds around), He allowed Himself to be killed on the cross! This was Jesus’ seventh and final step all the way down from heaven. In His time on earth the cross was the most despicable and vile form of execution. If you’re reading this at work take some time to mediate on this alone later. Stressed to the point of sweating blood. Slapped and spit on the night before. The whip used had several leather straps with metal balls at the end. One physician says by the end of the flogging His back and legs were probably nothing more than an unrecognizable mass of torn bleeding tissue. Our Lord tried to carry His own cross, but the intense weight was too much as His body weakened from losing copious amounts of blood. An iron nail was driven firmly through each wrist and one through both feet. For hours He hung on that cross. For hours He hung there! Could you imagine the pain as those nails tore through His flesh? Pain was shooting through Christ’s body. Jesus’ blood came streaming down! His muscles gave out. Jesus suffocated. Our Lord cried, “It is finished” and surely He died on that cross. When you read the words ‘He humbled Himself and became obedient to the point of death, even the death of the cross’ think about what that really means! Jesus did that just for you! Surely he died on Calvary. 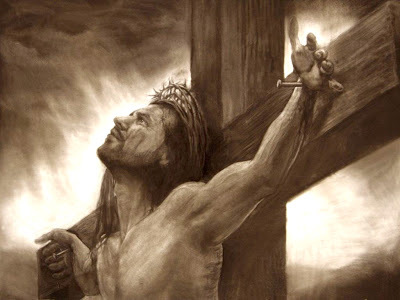 He hung His head and died for me. Do you see just how low Christ took Himself for us? This week we have been looking at just how much Jesus did for us. 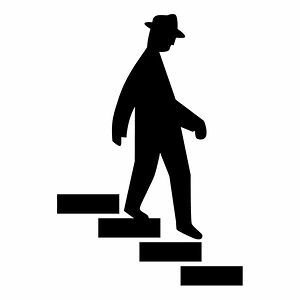 With each step He lowers Himself in an effort to redeem mankind. And now the Lord Almighty, Jesus, allows Himself to be killed. 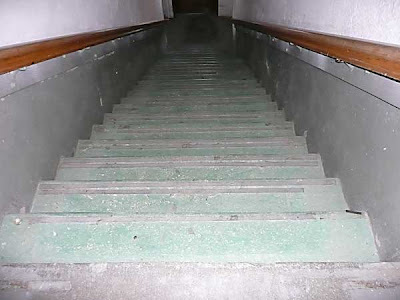 This is Jesus’ sixth step down from heaven. Christ left heaven’s glory to come to a filthy earth and be killed. This type of love and humiliation is beyond human comprehension. Death is the penalty of sin. Jesus is God and we know that He is absolutely holy and therefore without sin. What kind of love is this? It is the type that only God can give. Who else would die for the sins of the entire world? He took the penalty of your sins so you don’t have to. Do you understand just how incredible His stepping down is? After becoming a servant; Jesus made Himself in the likeness of men. He gave up His splendor and took on the appearance of a human being. This was His fourth step down. This may not seem like a big deal until you really think about it. Think about how much greater a human is than an ant. If you were reduced to the greatness of an ant how would you feel? Compared to us ants are weak, insignificant, and virtually meaningless. How much greater the plunge from Almighty God in heaven down to this earth! Next, Jesus humbled Himself. This humbling is Jesus’ fifth step down from heaven. This may not seem like much unless you actually think about Who we are talking about. As humans we are required to humble ourselves. Sometimes to our parents, supervisors, and when we have made mistakes. But this is The Lord Himself we are talking about now! He needs to humble Himself to no one. Christ Jesus is the all-powerful self-existent God. Yet He did it anyway. Why? Because He loves you and me that much. Christ exercised humility and took on a role that was far beneath Him to come and save your soul. This is the true path to greatness. Jesus emptied himself to come to the world and save you. This was His second step down from heaven. What did He empty Himself of? Many people claim that Christ emptied Himself of His deity, but this is not true. God could never stop being God. No, He emptied Himself of His glory. He remained God, but gave up His splendor. Jesus also became a servant. This was His third step down from heaven. Not only did the Lord lay down His splendor, but He also became a servant. Wow. How many of us get offended at the thought of serving other people? Jesus, knowing all the wrong every single person would do, still came down to be a servant; as a carpenter, working miracles, and eventually giving His life for the sins of the world. Christ knew that none of these acts of humility would compromise His position as God. When you humble yourself to serve others that does not make you a lesser person. In Christ it makes you a greater person. Jesus Christ took seven steps of humiliation down from heaven just to save your soul! Christ’s love for you is far above human understanding. The first step Jesus took down was leaving heaven’s glory. As the ever-existing Word; Jesus has always been. He was in heaven with the Father as God. Christ left that just for you. Jesus’ love for you is displayed through His selflessness. If you had the opportunity be in heaven with God would you give that up just to go save somebody else? Jesus cares about you that much. He left peace and perfection for sinfulness and pain. He came down to lift you up. Christ did the work that we could not do for ourselves. Christ left heaven in all of its splendor just for you. He loves you! If you are a true Christian, then you have been blessed greatly by the Lord. 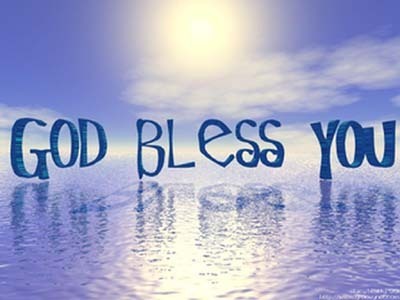 You have been blessed with every spiritual blessing in the heavenly places in Christ. Here Paul is praying for our enlightenment. Now that we have been blessed, we must seek God in the Spirit to understand exactly what those blessings are and how they apply to our lives (this means we have to study!). God’s people miss out on His best because we are too worldly-minded. But there are things that God has done for you that can not be affected by anything that happens on earth. Christ has redeemed you, given you new life, indwelled you with His Spirit, prepared good works for you, prepared a spiritual inheritance for you to receive, and the list goes on and on. “Are you ever burdened with a load of care? Do you know just how blessed you are? Most of us do not. We waste time striving for what the world deems as blessings. But if you are a child of God then you have already been blessed with every spiritual blessing in Christ! We get down and discouraged often because our focus is on the wrong things. We focus on temporary stuff and temporary situations. But Christ has blessed us eternally. If more of us realized that our outlook on life would be much different. The greatest blessings the Lord gives His children trump anything that happens to us in this life. Read Ephesians 1:3-23. Christ has redeemed us from alienation from God through sacrificing His life. God has predestined good works for those who trust Him. Your life is already handled; just follow God’s plan. Christ sent the Holy Spirit to live inside every Christian. The Spirit is the mark and guarantee of your salvation; you can’t lose it. The Spirit also helps you understand the Bible and brings it back to your memory; if you take time to study. Now Jesus is in Heaven at the Father’s right hand. We are Christ’s body and therefore positionally seated in Heaven as well. Wow. God’s grace is so awesome. 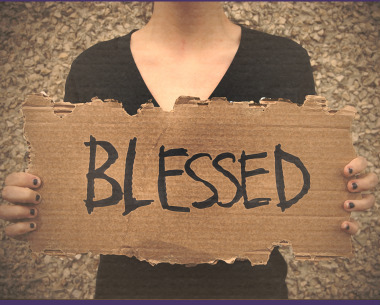 Do you really understand just how blessed you are? We ask God and we wonder why we are not being ‘blessed.’ We get caught in the trap of materialism. God has done so much for us and we need to be more conscious of that. There are so many things the Lord has done for us, but perhaps the greatest is Him bestowing His grace on us. Our salvation is only the result of God’s awesome grace. He blessed us when we couldn’t help ourselves. Not only has He given you His grace; God has lavished His grace on you. Ephesians 1:8 says God made His grace abound toward you in all wisdom and prudence. 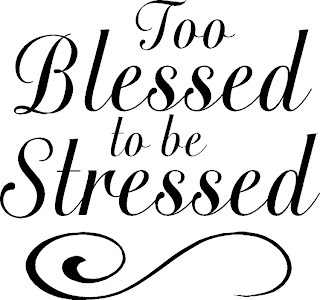 If you are like most people sometimes you may feel like you are not blessed. But never forget that God has blessed you immensely with His abundant grace among many other amazing things. Not only just in salvation, but God’s grace keeps you throughout your entire life. If you are a child of God, then you are blessed with God’s grace! God has blessed us with every spiritual blessing in the heavenly places. We get caught in what we presume to be blessings. We look at what other people have and then question God. “Why are You not blessing me, Lord?” “Jesus, why are You holding good things from me?” Our minds are just focused on the wrong things. We waste time trying to get more stuff from God when He has already blessed us with everything we will ever need! Spiritual blessings are better than material blessings. Stop looking around and look up. Forget about what things someone else has or what you don’t have and focus on all that God has done for you. In Christ you are eternally rich; regardless of what the bank statement says. You must be spiritually minded in order to understand these things, however. Get your focus off of the world and tune into all that Christ has for you! If you are a child of God, then you are blessed. You are blessed beyond anything you can imagine. Everyone that has accepted Christ as Savior has been blessed by God, as Paul says, with every spiritual blessing. Notice the past tense here. You have already been blessed with an abundance of spiritual blessings. God has been and is still very good to you. Through dedicated Bible study you can find out just what all those spiritual blessings are. 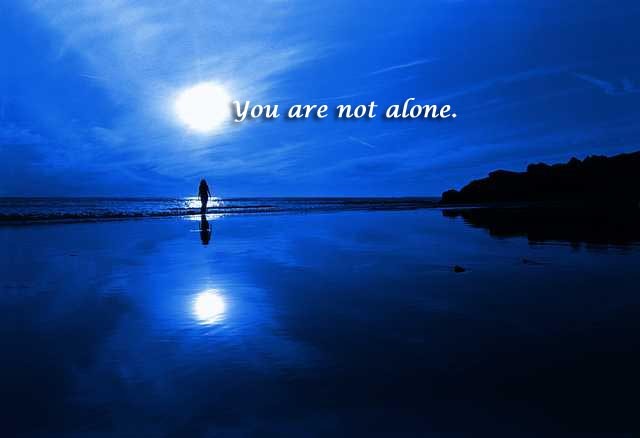 In Christ you have been restored out of alienation from God. In Christ you have been redeemed through His blood. Because you are saved you have been given the Holy Spirit who is the guarantee of salvation. These are just a few. In a world that is driven by materialism; we can easily get caught up in looking to God only for material ‘blessings.’ But the blessings we have access to are spiritual and are therefore far greater than any material thing. If you are a child of God, then you are truly blessed beyond measure!!! God is so awesome! How awesome? More than words can express. I think Paul says it best with the words ‘exceedingly abundantly’ (Ephesians 3:20). If you are Christian thank God you serve a real God. You don’t have a false hope. You don’t serve an idol. You don’t have to wonder if your prayers are really being heard. You serve the one true God. Live like it! Do you hold anything else in your life above or at the same level as Jesus? How is that working for you? If you are honest with yourself you will admit that nothing can give you the joy and peace Christ gives. To know the unparalleled love of Jesus and seek solace somewhere else is the epitome insanity. If you have been born again you have been extended the opportunity to intimately know God. Do you live like it? So many people waste their lives in feeble attempts to get to know God. The enemy has flooded their minds to believe that they must work their way to God. This is the ‘god’ that many people believe in. An angry being that is upset with humanity and all we can do is try to act good enough to know Him. Christians know that this is not the case. We know what the true character of God is like. And that character is revealed in the person of Jesus Christ. God gives us the opportunity to know Him through knowing Jesus. That is an awesome opportunity! There are far too many people in this world who don’t know Christ. People who wander aimlessly through life searching for what you have. God allows us to know Him and he truly desires that everyone would have a relationship with Him. Do you take full advantage of your relationship with Christ? If more of us truly understood the joys of salvation we would be more inclined to tell others about Christ. You have a relationship with the one true God. Live like it. There is only one true God. Throughout history people have distorted what we as Christians know to be true. Some people think there are many Gods. Some believe that there is one God, but they try to skew what His character is like. God says besides Him there is no other. Nothing or no one is worthy of being compared to or held at the same esteem in our lives as the Lord. There is no one else like God. Don’t forget that. You may not believe in another ‘god’ so to speak, but what about your idols? Be mindful not to place anything in your life above Jesus. Stand firm when people speak against the truth of the true living God. This all knowing and all powerful God allows us to know Him. You have a relationship with the one true God. Live like it. If you are child of God then you have a relationship with the one true God of the universe. Every other faith and religion that exists in this world is a misguided attempt to know the Lord for real. People try through works, spiritual journeys, and even giving money to get to know God. As Christians we actually have the one way to God; Jesus Christ! That is an awesome privilege. 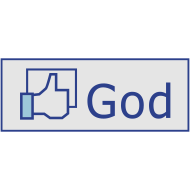 If you are a Christian, then you know God. God is your Father. God is your best friend. God is your provider. God is your refuge and strength. You have what so many other people are longing for. You have all that you need through Christ. If you know God, then you have a great life and a bright future ahead! When you’re up; bless the Lord. When you’re down, bless the Lord. When you feel like it; give God the glory. When don’t feel like it; give Him the praise. No matter what you can see; Christ is always great and worthy to be praised. Change your outlook on life. Disrupt the enemy’s attack on your attitude. Change the spiritual atmosphere of those in your sphere of influence. Look up to Jesus and bless Him with ALL that is within you. BLESS THE LORD! I sought the Lord, and He heard me, And delivered me from all my fears. What happens when we send praises up to the Lord? David said he would bless God at all times. David vowed that God’s praises would always be in His mouth. This led him to understand that when he sought the Lord, he was heard. 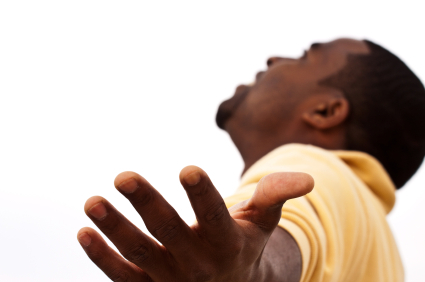 Praising God reminded David that when he sought God he was delivered from all his fears. When need to understand that whenever we seek God only good things can be the result. So how often are the praises of Jesus in your mouth? It is easy to get cause up in your problems when your focus is off. However, when you spend your time praising the Lord for all He has done, then you will be more inclined to seek Him at all times. The more you seek Him, the more spiritual success you will have in life. Do you ever just spend time just praising Christ for who He is? David had a roller coaster of a spiritual life. But he vowed to bless God at all times. When he was riding high; he would send praises up to the Lord. When he was lower than low; David would still recognize God for His excellent greatness. Why? Because through it all David understood that God is great and always worthy to be praised! David probably also knew that praising God does something for the soul. Remembering all the benefits of salvation will yield heartfelt praise. After David said he would bless God will his entire being, David goes on to say do not forget all God’s benefits. What are some of the benefits of being in Christ? 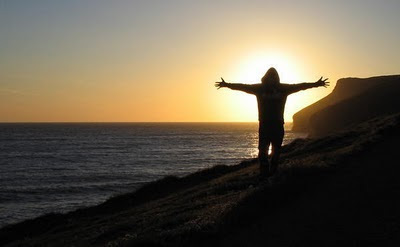 In Christ we are free from the penalty of sin, we have new life through Christ, and access to every spiritual blessing. These are just a few. When you think about all you have access to in the Lord; praise should be the natural outpouring of your heart. No matter what else is going on. No matter where you are. Remembering God’s abundant goodness towards you should yield praise! What are some of the benefits you have received from God? If you are honest with yourself there are too many to keep track of. Praising Jesus may not change the circumstance, but praise will change your outlook. So remember all the benefits of being in Christ and bless the Lord with all that is within you! We all have something to praise God for! No matter what the situation may be; this is always true. David said he would bless the Lord with his total being. David definitely had some ups and downs, but he would not let that stop him from giving God the praise. Why? Because David knew who God truly was. When we think about God and all He has done for us we should feel compelled to bless his name with all that is within us. You have something to praise God for! He is worthy so give Him the praise. You were made to praise God. There is no better feeling than doing what you were created to do. Take a moment to stop thinking about all the negative things and just bless the name of the Lord. Tell Jesus how much you love Him. Thank Him for all He has done for you. Because when the praises go up, the blessings come down!